I would like to thank the contributors for three of the articles to this month's newsletter. The first article features Bassett photos provided to me by Roger Ripley. 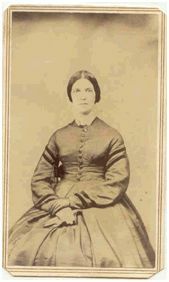 They feature the family of Barachiah Bassett. 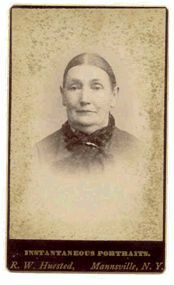 This family is very fortunate in that several albums have been saved from these families over the years and have made it into the hands of descendants. 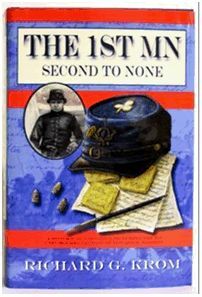 The next article features a book written about the Civil War service of Edward Henry Bassett of Minnesota. The book and write up were written by Richard Krom, a descendant of Edward Henry Bassett. 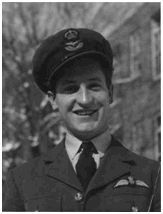 The last article features a World War fighter pilot, Francis Bernard "Bertie" Bassett, who served with the RAF during World War II. The article and pictures were taken by Alan Bassett of England. For those living in Illinois that have not seen my Bassett DNA presentation, I am speaking in Ottawa, Illinois on Saturday, September 18, 2010 at 1pm. I am also speaking at the Illinois State Genealogical Society meeting held on October 23, 2010 in Peoria, Illinois. If you plan to attend either talk, please let me know and I can give you details of the presentation. 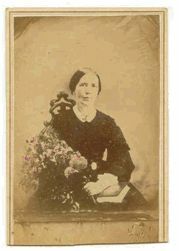 The following pictures come from two family photo albums of Cynthia Bassett Ripley and Frances Bassett Mitchell, daughters of Barachiah Bassett, now in the possession of Elsie Rivard. They are on loan to Roger Ripley, and Roger has kindly supplied me with scans of the images below. 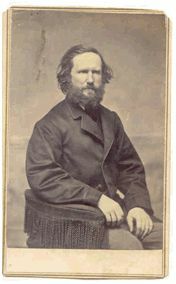 Francis Bassett, son of Barachiah Bassett was featured in the April 2005 newsletter and this article can be seen by clicking on the link below. 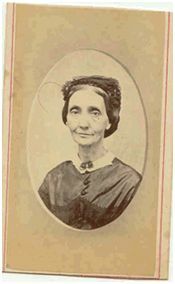 Bassett, Nancy, formerly of Lowville, wife of Barachia; died at Alexandria, Jefferson Co., 6 Mar 1845, aged 60. The old Oatman House in Lowville is being extensively repaired. It is one of the oldest buildings in the county and was built about 1800. It was kept as a public house in 1812 by Barachiah B. Bassett. In 1832, Bassett, who was a strong Methodist, changed the house to a temperance hotel. William Ichabod Bassett descends from #56B Jonathan Bassett. William I. Bassett, 55, retired vice president of the Otis Elevator Company, yesterday on the witness stand in Supreme Court, Mineola, in the separation action brought by his wife, Margaret Helen Bassett, of Port Washington, contradicted her testimony in regard to circumstances which led up to their separation in August, 1934. Bassett denied he had urged his wife to go to Reno and get a divorce. He said that he had repeatedly tried to keep her from taking that action. 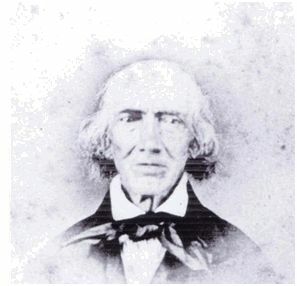 Bassett declared that his wife turned over to him the 49 shares of stock in the realty company of which he was president on the condition that he would take care of the children. He also said that his wife told him that he could have all of her jewelry except her wrist watch and wedding ring, which she wished to give to their two children when they grew up. The defendant also denied that he treated Mrs. Bassett cooly upon her return from Bermuda in January, 1934, and told of writing to her while she was in Bermuda and also in Reno. Testimony was given also by Sally Steele, 246 West End Ave., and by Ruby P. Fletcher, who came from Reno where she has been taking care of the Bassett children. Miss Steele, a nurse in the Bassett home in 1933 and part of 1934, said that Mrs. Bassett told her that she was going to ruin her husband. She said she was going to get a divorce, Miss Steele testified, and that she would always get what she wanted if she threatened to go to Reno. She characterized Mrs. Bassett’s behavior as irrational. A new book is available about Edward Henry Bassett, a soldier from Minnesota who served in the Civil War. This book was written by Richard Glen Krom, a great grandson of Edward Henry Bassett. The following is a short write up from Richard. I have just published a book on Edward H. Bassett in the Civil War. It is the product of a search lasting more than 9 years that finally brought me copies of 218 letters he had written while in the First Minnesota Volunteer Infantry Regiment and the First Minnesota Heavy Artillery Regiment during the war. Over 2 1/2 years have gone into the writing and composing of my book and it is an accurate historical documentary. The book is 730 pages in length and includes the 218 previously unpublished letters of my Great Grandfather, Edward H. Bassett interwoven in an extensive historical narrative. Other features include 140 illustrations from the period, a detailed chronology of the activities of the First Minnesota Regiment during its service and a complete index. Through this gripping historical narrative you can join “The regiment that never runs from the enemy.” Relive the daily struggles of these brave patriots through 140 period illustrations and numerous quotes and anecdotes that bring the story to life. Join the fight with the First Minnesota Regiment as they hold their ground at Bull Run. Stand shoulder to shoulder with them when they save the day at Antietam. Charge into the wall of whistling death at Gettysburg with this band of brothers as they face six times their number and stop the rebel advance! This is the story of their day-to-day endurance and heroism. Experience the arduous marches, endure camp life, hard rations and glory, death and suffering on the battlefields. 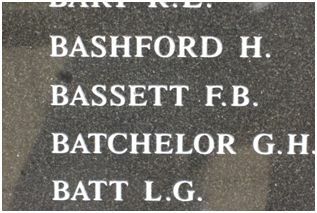 Francis Bernard "Bertie" Bassett was born 30 Apr 1920, son of James P. Bassett and his wife Annie Jack. James P. Bassett, son of Henry Bassett, a tailor, and deceased at the time of his son's marriage, married Annie Jack 24 Jul 1913. James was listed as a Schoolmaster. Any further knowledge about this Bassett line would be appreciated. This year sees the UK celebrating the 70th anniversary of the Battle of Britain. By the end of June 1940, with Eastern Europe overrun by the German forces, England standing alone, the next phase of World War 2 had to be the invasion and subjugation of Great Britain. Before an invasion could be mounted however, the skies over Britain had to be dominated; the Royal Air Force had to be destroyed by the Luftwaffe. This led to the unique situation of a battle involving solely opposing air forces. The recognized starting date is 10 July which saw the Luftwaffe carrying out attacks on shipping in the English Channel, drawing out the RAF from the airfields in south east England. In mid August however enemy attacks concentrated on Fighter Command airfields and radar stations along the coast. Day after day throughout the summer of 1940 the RAF fighter squadrons repeatedly met the attacking aircraft, often flying two or three sorties a day. The battle reached its peak on Sunday 18 August when the Luftwaffe flew nearly a thousand sorties in major attacks against RAF airfields. Then in early September, in a change of tactics, the Luftwaffe began its bombing raids on London. The Luftwaffe mounted a final all-out attempt to finish off the RAF on the 15 September; the Germans believing that the RAF was down to 50 fighters (it actually had 630 Spitfires and Hurricanes) attacked London repeatedly throughout the day drawing up RAF squadrons to counter each raid. 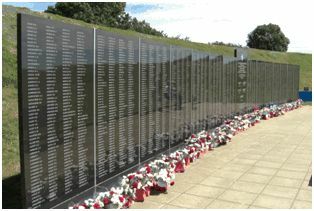 All RAF squadrons were committed on that day, there were no reserves, some pilots flying four sorties. The Luftwaffe lost 56 aircraft on that day (the RAF 28) and realized that the RAF would not be beaten. This has since been commemorated as “Battle of Britain Day”. By the officially recognized last day of the Battle, 31 October, the German invasion of the UK had been called-off, and the strategic defeat of Germany in WW2 began. Great Britain was defended by just under 3000 men of Fighter Command, well over 500 of them died in the Battle; nearly 800 of the survivors being killed by the end of the war in 1945. In a speech to Parliament on 20 August Prime Minister Winston Churchill made his famous remark: “never in the field of human conflict was so much owed by so many to so few”. One of the “few” was 41982 Pilot Officer Francis Bernard Bassett RAF. Bassett was born on 30 April 1920 in Willesden, north-west London. He joined the RAF in March 1939 and received basic flying training at No.4 Elementary Flying Training School at RAF Brough, East Yorkshire. From there he was sent to No.12 Flying Training School, Grantham, where he received his “wings” on 09 Sep 1939. On 06 Nov he was graded as a Pilot Officer and posted to 266 Squadron at Sutton Bridge which had just reformed and was to be equipped with Fairey Battles. Bassett was however post away to 222 Squadron on 25 Nov which was based at RAF Duxford, Cambridgeshire, equipped initially with the Bristol Blenhiem 1f. Unfortunately, he sustained serious injuries as a passenger in a Magister which hit a tree near the airfield; the pilot died shortly after the accident. 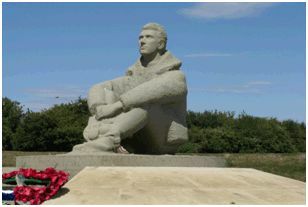 Bassett was hospitalized and on sick leave until 18 Aug when he was posted back to 222 Squadron, flying Spitfires, and based at RAF Kirton-in-Lindsey, Lincolnshire. On 29 August the squadron went south to RAF Hornchurch in the London area in the thick of the fighting for the remainder of the Battle. PO Bassett is recorded as flying Spitfires and being engaged in the fighting. On the 06 Nov 1940 he was promoted to Flying Officer and posted to Canada as a Flying Instructor. He returned to the UK in September 1941 and was posted in December to 152 Squadron at RAF Coltishall, Norfolk, flying the Spitfire IIa. In June 1942 the Squadron moved to RAF Eglinton in N. Ireland for bomber protection duties in the Western Approaches. On 06 November 1942 Bassett was promoted to Flight Lieutenant and the Squadron was sent to Malta. On the 14 November on the leg from Gibraltar to Algiers, his Spitfire Vb, one of a formation of 18, was seen to catch fire and he was forced to bale out. He was seen climbing in to his inflatable dingy but when Spitfires returned to look for him, they found no trace. match on 37/37 markers verifying that they do indeed share a common Bassett ancestor in Redruth, Cornwall, England.